Cardiac arrest is not the same as a heart attack . When a person has a heart attack, the blood flow to the heart is interrupted. This may be due to problems with the coronary arteries, such as a build-up of plaque, a blood clot, or a thickening of the artery walls. About cardiac arrest. American Heart Association website. Available at: http://www.heart.org/HEARTORG/Conditions/More/CardiacArrest/About-Cardiac-Arrest%5FUCM%5F307905%5FArticle.jsp#.WblD5rKGNQI. Updated March 10, 2017. Accessed September 13, 2017. Cardiac arrest in adults. EBSCO DynaMed Plus website. Available at: http://www.dynamed.com/topics/dmp~AN~T116814/Cardiac-arrest-in-adults . Updated September 1, 2017. Accessed September 13, 2017. 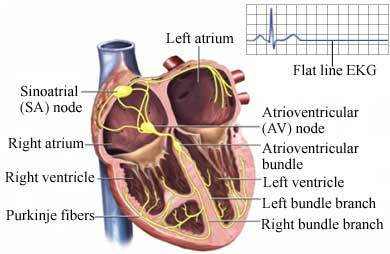 Sudden cardiac arrest. Heart Rhythm Society website. Available at: http://www.hrsonline.org/Patient-Resources/Heart-Diseases-Disorders/Sudden-Cardiac-Arrest-SCA#axzz2IzsoUyQ9. Accessed September 13, 2017.